In many religions and cultures it is believed that when we post everything about our children's lives on social media, we could be inviting negative vibes. My mom always warns us, “Don’t post everything about your life on Instagram”. 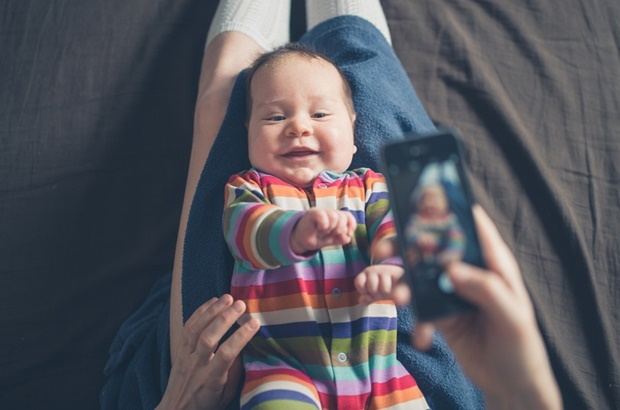 But her Generation Z kids are much too excited about sharing their latest grand purchase and her Millennial daughter can’t help posting pictures of her little ones with every new milestone: #baby’sfirststeps #baby’sfirstwords #blessed [insert heart emoji]. Although we’re all guilty of gushing and sharenting – updating every social media app we have with proud moments of our children – my Indian Muslim mom, like many others, worries about nazar, or what is commonly known as the “evil eye”. The evil eye is the belief that through malicious and malevolent thoughts or even unintentional and unconscious envious looks, one can put misfortune upon someone else. Even in children’s stories and fables we’re taught about curses, spells, witches and warlocks, who paralyse any chances of you having a good life. In Sleeping Beauty, the “Mistress of all evil”, Maleficent, casts a spell on baby Aurora after not being invited to her christening. But evil fairies casting spells with their magical golden sceptres aside, we were taught that someone might not always have the best intentions and their jealousy could make them spiteful and nasty, even unintentionally so, causing harm to you. So in my religion and culture we are encouraged to avoid sharing every detail of our lives with others. Whatever you choose to do, don't brag about it. Keep it between you and the Almighty. Any arrogance will make your effort meaningless. Some even believe in wearing amulets around their necks with scriptures of the Quran, having their little ones wear black bangles, and making a small kohl circle (like a beauty mark) on their cheeks. And always saying “ma sha Allah” (“god willing”) to show appreciation, joy and praise, reminding yourself that everything is achieved by the will of good, invoking God’s blessings upon something or someone. Also read: Stop putting your child's photos on Tinder! Where does the evil eye come from? Does it really exist? While different religions and cultures may have slightly differing ideas about the evil eye, we’ve all heard the saying that “the eye is the window to the soul” and been repeatedly told about the power of eye contact and visual communication. Moreover, there’s nothing quite as dominating as a powerful and controlling stare to command the weak. There are many sceptics who will tell you this is all hocus pocus, and understandably so, considering there is no scientific proof validating the existence of the evil eye. It’s more of an ancient belief in various cultures. The traditional cure for the evil eye, or mal de ojo, in rural Mexico involves the help of a curandero – a shaman or healer – while in Italy it’s believed the cornicello, a “little horn” amulet, will keep mal'occhio away. Although I have yet to find a scientist with any physical proof that the evil eye exists I did find a clinician’s perspective. Maria Baratta Ph.D., L.C.S.W., writes that she had a discussion with her then 92-year-old Italian father, telling him she suspected she had mal’occhio, since her stomach hadn’t felt right. She goes on to explain that although, she doesn’t necessarily think there is such a thing as the evil eye or that particular talismans, amulets and rituals will protect and cure your afflictions, she does believe there’s some power in knowing that someone cares. Whether you believe in the evil eye or not, keeping your personal life private is better than living in the spotlight and completely immersing yourself in the social media landscape. Especially if you consider that we often only ever post our very best pictures on Instagram and Pinterest and talk about the best of times of Facebook, which might not be a true reflection of what life is really like. As we’ve written here, this could even lead to psychological problems and self-esteem issues, as you start comparing yourself to a level of perfect that may not even exist. Also read: What are finstas and why should parents know about them? I don’t need to be posting everything about my life online anyway. People, whether they mean to or not, will always judge the life you live and validate it with likes and shares. And even if you don’t believe in nazar, you don’t really want to be inviting any such negative vibes, even if it’s just a little bit of jealousy and a snide remark that might not even get back to you. But I urge you, as someone who can’t help herself from gushing and sharenting from time to time, when you’re on my profile, double tap and if you’re going to comment, I’d really appreciate a heartfelt “ma sha Allah”. Do you believe in the evil eye? Do you believe that by sharing everything about your life on social media you might be welcoming negative vibes? Tell us by emailing chatback@parent24.com and we may publish your comments. Don't put your naked child on the internet!